LIGONIER, PA – September 8, 2013 – Last night, at its Annual Golden Ticket ceremony held in Santa Cruz, California, Amusement Today Magazine (http://www.amusementtoday.com) recognized Pennsylvania’s Idlewild & SoakZone (http://www.idlewild.com) as the ‘Best Children’s Park in the World’ for the fourth consecutive year. “The annual Golden Ticket Awards are the amusement industry’s equivalent of the Oscars, with amusement park owners and managers, ride manufacturers, and other industry officials gathering to salute the industry’s top parks. 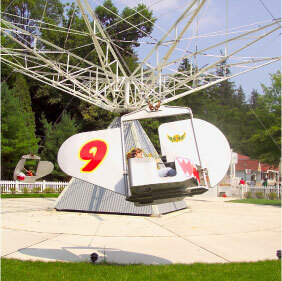 Winners were selected by amusement park enthusiasts, voting from around the world,” said AmusementToday.com. For more information about the 2013 survey results, visit: http://www.goldenticketawards.com. ABOUT AMUSEMENT TODAY’S GOLDEN TICKET AWARDS - Amusement Today is an amusement industry trade publication based in Arlington, Texas. Introduced in 1998, the Golden Tickets are the most prized awards in the industry. Amusement park fans worldwide are asked to rate the top parks in 25 categories. The 2013 international poll was the eleventh for children appeal in its 17-year history. For more information, call 817.460.7220 or visit http://www.amusementtoday.com. ABOUT IDLEWILD & SOAKZONE - Founded in 1878 as a picnic ground along the Ligonier Valley Rail Road, Idlewild & SoakZone (www.idlewild.com) is the oldest amusement park in Pennsylvania and third-oldest in America. Featuring seven theme areas, operations run late-May through Labor Day with “Hallowboo,” a Halloween-themed event, taking place in October. Idlewild is part of the Palace Entertainment family of parks that hosts over 14 million visitors annually at five theme parks, two animal parks, 10 waterparks, and 21 family entertainment centers. For more information, call 724.238.3666 or visit http://www.idlewild.com and http://www.palaceentertainment.com.